In the mid-1990s, film director Christopher Nolan and his wife sailed across the English Channel, specifically from Dover to Dunkirk, trailing the sea passage of many small boats that helped save the lives of hundreds of thousands stranded on the French beach in the World War II evacuation operation. That is when Nolan decided that he wanted to turn that journey into a movie. He only got round to it some 25 years later and I think it’s one of the greatest war films ever made. It has little dialogue, but the suspense, the tension, the pain, the sorrow, the relief of the land, sea and air operation comes out through the cinematography and the music score. The Battle of Dunkirk was not a victory per se, but my God, wasn’t it a great victory of resilience, of never giving up? It came at a point when Britain was even discussing the possibility of a conditional surrender to Germany. The threat of German invasion was so real that Winston Churchill (who had only been Prime Minister for 16 days) proposed laying gas along the beaches of the south coast of England. In the event, although 68,000 British soldiers were killed or captured at Dunkirk, thanks to the insignificant small fishing boats, pleasure cruisers and ferries, 300,000 men were saved. The role of the small boats was the most effective contributor to the success of the action. They were able to get closer to the shallow shores than the warships, and they lifted troops who were queuing (queuing politely!) in the water, shoulder-deep in water for hours. This was an operation of the collective, and to this day the ‘Dunkirk Spirit’ refers to the solidarity shown by normal citizens in times of adversity. I was recently on the very same Dunkirk beach. We walked for two hours and still there was no end in sight of the vastness of the sand. I shuddered to think that all of that space was crammed with soldiers awaiting their fate, or rushing through the waves only to be gunned down in the surf. 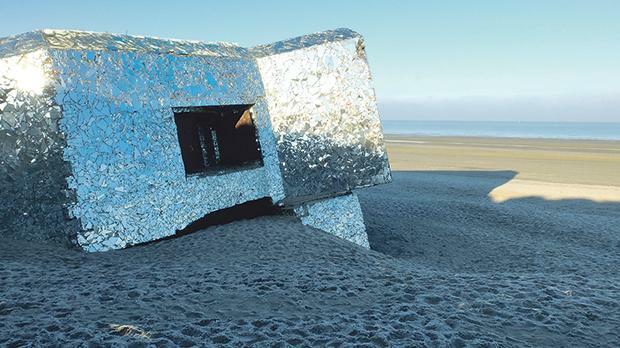 To this day, bulky concrete bunkers still dot the dunes as a cruel reminder, but the most impressive was one that has been turned into an installation by an artist. In four years, the artist covered all of the bunker in shards of mirrors, and at the end called it Reflechir. • In Pakistan, following a Supreme Court investigation, the Prime Minister was disqualified from holding public office because of revelations of family assets in offshore accounts. • In Spain, the Minister of Industrial Affairs resigned when his name was mentioned in the leaks. According to Judge Giovanni Grixti, the Panama Papers were obtained by hacking Mossack Fonseca’s servers. Hacking, he said, is illegal, and therefore 1+1 = zero, and he could never consider the Panama Papers as legal grounds for an inquiry to investigate the two Maltese holding public office mentioned in the leaks: Minister Konrad Mizzi and the Prime Minister’s Chief of Staff Keith Schembri. Presumably he expected ICIJ journalists to politely phone Mossack Fonseca and ask them please, pretty please, could they hand over all the details of the illicit financial dealings of its international clients, including secret accounts planned to evade taxes. Hands up those who think that Mossack would have replied with an: “Of course, come over for tea and we’ll give you all the information about our shady clients and corrupt people in public office”. Presumably, by his own argument, Mr Justice Grixti would have rubbished the journalistic investigations which led to the exposure of Watergate, the Lai Massacre, the News of the World phone hacking scandals, and so many others. It is very clear to me that the judge either had a bit of an anserine moment or else he desperately needs to go to Dunkirk and take a good look at the reflection of his soul in the Reflichir monument.